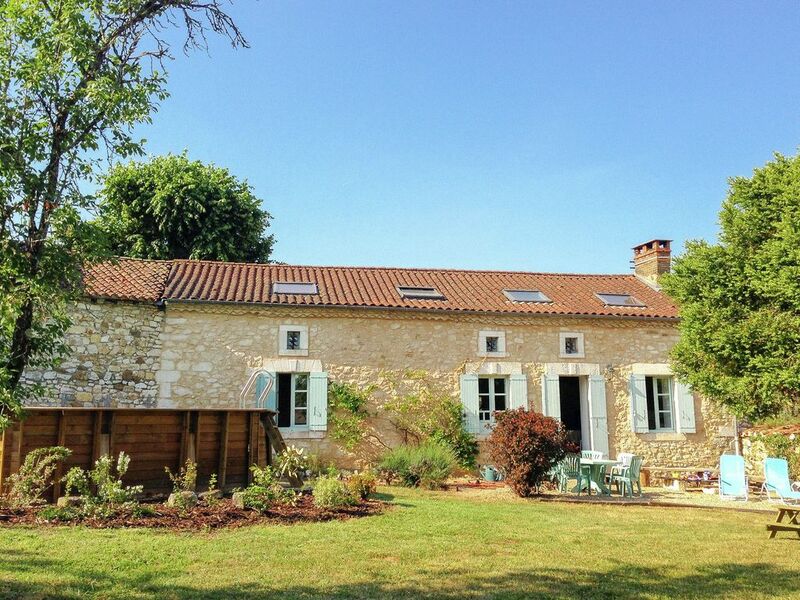 Peace and privacy in a beautiful farmhouse with private pool and large garden. This lovingly renovated and furnished farmhouse on 10 HA is very spacious and comfortable and also suitable for two families. Many original features, wooden beams, stone and magnificent fireplace have been retained which add to the charm of this property set in a peaceful location. On the ground floor you will find a separate guest house (bedroom and bathroom) for two people, and on the first floor three spacious bedrooms and a bathroom for another 6 people. Het house is in a rural setting, but within 5 minutes you are in Thiviers, a lively village with almost all the facilities you need including a weekly farmers market on Saturdays. You can also make nice day trips from your holiday to beautiful cities like Perigueux, Limoges and Angouleme. Ideally situated to explore the many local delights of the Perigord Region including traditional markets, Caves and Chateaux. The lake at Nantheuil (7 km) is popular with sunbathers and swimmers (also for fishing). Also nearby are: St. Jean de Cole, 10km (a &quot;most beautiful village of France&quot;, castle, church & priory Brantome, 29 km (pretty village, Benedictine Abbey, river, canoeing, parks & gardens) Grotte de Villars, 26 km (impressive cave system with prehistoric paintings) Perigueux, 29 km (historic town & Cathedral) Chateau de Hautefort 23 miles If you want to get away from the daily stress of life this is the perfect place.